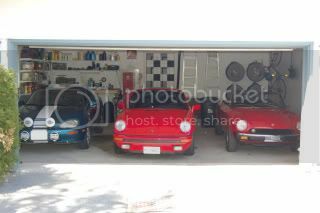 When I bought my 1977 Porsche 911S in 2006, I paid what I felt was a very good price. I knew there would be maintenance and repair problems to solve in a 29 year-old car, but I estimated that even if it amounted to another ten thousand dollars, I still had gotten a good deal. If only it had been that little! Although the original engine in 1977 was a magnesium block 2.7 litre, a previous owner had swapped that for a 1979 aluminum block 3.0 litre engine. The car had 259,000 km on it when I bought it, but the engine had been rebuilt more recently than that. The first major job was to rebuild the transmission, since it was well worn and grinding when shifted from second to third without double-clutching. In the spring of 2007 I had this done, after having considerable difficulty with it at my first track days in May 2007. Suddenly it became very drivable, but I began to get concerned about the engine. Over the balance of the summer, the engine began to use more oil and its temperature would frequently reach 120 C. Clearly something had to be done to bring these parameters back to normal. By mid-October, the car had become impossible to start and compression and leak-down tests were well below specification. Between November 2 and March 29, 2008, the engine was rebuilt to a higher performance spec. We increased the bore to 98 mm, for a displacement of 3.2 litres and reground the cam shafts to a more aggressive profile. The power of the engine had increased to 220-230 bhp and it should have run a lot better. However, throughout 2008 there were several track days when oil consumption and/or temperature were higher than normal. We addressed these issues by improving air flow to the oil cooler. In addition, numerous repairs and modification were required to the brakes, ignition, wheel bearings, shift linkage, CV joints, etc. The list of things to check and tools to take to the track kept growing. Nonetheless, it was a successful track season and I looked forward eagerly to 2009. Over the winter of 2008-2009 I installed brake cooling ducts, rebuilt all the brake cylinders, installed delrin sway bar bushings, added tow rings for the trailer I planned to buy, and adjusted the valves. The 2009 track season got off to a good start, with a trip to Virginia International Raceway. While there, I was black-flagged for blowing oil smoke in Turn 1, but couldn’t find anything wrong. Later, at Le Circuit Mont Tremblant in June and July, people were telling me that I was trailing a mist of blue oil smoke. I attributed it to the fact that the engine builder had intentionally left off the seals on the exhaust valves, as was his habit. However, in July at Calabogie Motorsports Park, with no warning the car used a litre of oil in one 30-minute session and the temperature threatened to exceed 120 C. Oil was leaking out of the tank and the engine, so I loaded the car on the trailer and took it to the engine builder a few days later. He confirmed a problem by doing compression and leak down tests and immediately set about removing and dismantling the engine. We found that all piston rings had broken! The only conventional explanation was detonation, but damage to the piston tops was very minor and only to one. We had to assume some inexplicable incompatibility between the pistons, rings and cylinder barrels, absent any other explanations. To his credit, the mechanic rebuilt the engine in about four weeks – some kind of record. While the engine was out, I had the oil coolers flushed and cleaned, to ensure that maximum cooling would be available. I got the car back together near the end of August and followed the break-in regimen to the letter, checking the oil after every 300-400 km. The valves were readjusted at 1800 km and the fuel injection mixture calibrated. I had some problems with stalling and failure to restart, which we traced to a failed MSD ignition box. I borrowed a replacement and sent mine to MSD for reconditioning. During the break-in routine – which took me only 18 days – the odometer clicked over to 300,000 km. At 3300 km I had reached the point when I could use a redline of 6000 rpm, so I took it to Calabogie for a lapping day. The engine felt a lot stronger than the previous one and compression was clearly higher – I could feel it on deceleration far more than with the previous engine. For the first 3 stints I didn’t go above 5000 rpm, as I worked on tire pressures and getting comfortable with new rear tires. In the fourth stint I took it to 6000 on one of the two long straights and noticed that I was only going an indicated 170 km/h, which is slower than before. Then I saw that the temperature was at 120 and the oil level indicator showed zero. I pitted and found I’d used a quart – in less than 40 km. When I added a quart, oil smoke was puffing out of the filler pipe. I then learned that I was blowing blue smoke at every corner, on acceleration. After getting home I checked the compression and on my gauge all cylinders were 140 psi (instead of 175-185), except #6 which was 65 psi. I contacted the mechanic and discussed the second engine failure with him. After hearing the entire description of the break-in procedure, the first three conservative stints at the track, and the subsequent engine failure, he’s at a bit of a loss. He’s beginning to suspect a failure of something in the oiling system, i.e. pump or scavenging bits, that would cause a build-up of oil in the (normally dry) sump and lead to overheating and excess pressure. I took the car to the mechanic when he returned from a trip to the Targa Newfoundland. I spent a couple of hours there, doing the compression and leak-down tests and green lighting possible causes of the failure(s). His readings were 160-170 psi and 11-12% leakage in all cylinders, except number 6, which was 70 psi and 82% leakage. And all the leakage was audible through the oil filler neck, meaning rings. We discussed so many factors, I can’t remember them all. Leaky fuel injector, damaged oil pump, damaged oil filter, blockage in external oil lines, pressure level in fuel injection, etc. He can’t figure out where the oil has come from that is on top of the engine, towards the front on the left – the pump is on the other side. And is there a reason, or is it coincidence, that both cylinder failures were in the right bank? A few days later I went back to observe and help with the dismantling of the engine. After mounting the engine to the stand, it took him a little over 2 hours to dismantle it to the point of removing the pistons. It’s a pretty impressive process, involving lots of complexity one doesn’t find in a normal (non-Porsche) engine. The casting of the cam housings is amazingly complex, with built-in bearings for the camshafts and rocker arms, plus oiling passages and spark plug accesses. There were no broken valve springs or damaged rockers, although one rocker had minute scratches in the normal direction of the cam lobe’s movement. The cam lobes were all clear. All the cylinder heads looked normal except for traces of oil that had blown back through the intake. The tops of all pistons were chocolate brown (normal), without any pitting that could be caused by detonation. Every cylinder wall still showed all of the honing cross-hatching. Number 6 had one tiny line running down in the direction of piston travel. Every piston ring was broken. All but two wrist pins were harder than normal to drive out. Some pistons had collapsed on their rings, making the rings difficult to turn or remove. There are surface cracks in several pistons, inside the journals where the wrist pins are located. They run longitudinally through the bore for up to 2 cm. The ends of the rings where the original gap had been were clean and straight, but not particularly bright under magnification, discounting notion of inadequate end gap at the time of assembly. Mahle offers a diagnostic service upon return of their products, which are all engraved with serial numbers and matched at delivery, including pistons, rings, wrist pins and cylinders. The mechanic spoke to their representative at Andial in California, who suggested two possible causes of this type of failure. The fuel injection system might be out of adjustment, worn, or miscalibrated, resulting in an excessively lean mixture at high engine speed. This could result in either excessive heat, leading to failure of the oil and components, or to non-uniform flame spread at the time of combustion, leading to a combustion shock effect that would act like a battering ram on the piston tops. The other potential cause could be a distributor misalignment or maladjustment, also leading to badly timed, non-uniform combustion. We suspect the fuel injection system has either been rebuilt (badly) or abused in some way by a previous mechanic. The solution could be a switch to carburetors, rebuilding the fuel injection or replacing it with a simpler, more modern, computer controlled system like MegaSquirt. The last option may be the most economical and reliable. I have subsequently discussed it with another PCA member who has the system and read an instruction manual for the Bitz Racing CIS to EFI conversion using MegaSquirt components – it may the right solution. The mechanic will ship the Mahle components to them for analysis and any other suggestions of possible causes. We re-examined the JE pistons from the first build and found the same surface cracks in the wrist pin journals. We will consult with JE as well, to get their ideas on the possible causes. While waiting for their response, we’ll separate the block and measure all the components to determine whether the rods, wrist pin bushings or any bearings may have been damaged. Meanwhile, I have removed the oil tank to have it flushed and pressure tested, to find and repair a pesky leak. We will not reassemble the engine until we are very confident that we have identified the cause of these two failures and fixed the problem. Mahle Racing in Mooresville, NC provided verbal feedback today, to be confirmed in writing. Their analysis shows that the pistons had become annealed due to extreme combustion temperatures. The annealing process would have softened the pistons and allowed deformation at the lands and wrist pin journals. They also found signs of detonation at the intake valve area. These signs of damage were uniform across all pistons. The most likely cause is miscalibration or plain dirt in the fuel injection system, allowing the air/fuel mixture to become excessively lean under heavy load, i.e. high rpm’s. All pistons and cylinder barrels are damaged beyond salvage. The solution will be to install a completely new set of pistons, cylinders, rings and wrist pins, plus a new fuel management system. While we could rebuild the old CIS system or install a new MegaSquirt system, I am inclined to go the route of the tried and true carburetor. A pair of new PMO 3-barrel carb’s, plus the associated linkages, pressure regulator, etc. will be more expensive than the other alternatives, but should result in a simple, robust and easily adjusted configuration. We’ll make a final decision in the weeks to come and plan to have the engine ready by spring. Meanwhile, I have flushed, pressure tested and repainted the oil tank, cleaned and repainted the engine bay, cleaned and painted the fibreglass engine shroud and powder-coated the exhaust valve covers. This baby is going to look good, as well as perform! The last rallycross of the season with the Motorsport Club of Ottawa was held once again at North Augusta Motorsports Park, about 45 minutes south of Manotick. I had prepared the Mazda by replacing a seized rear brake wheel cylinder and installing the rally gravel tires. I loaded it on the trailer the day before so I was ready to go first thing in the morning. The day began with heavy overcast and intermittent light rain, which would result in three events in a row taking place in wet and muddy conditions. It’s become a tradition. I got to the track at the same time as Greg, the organizer of the event. We looked at the track, which is laid out like a 0.6 km dirt oval with high banking at the ends and a fair-sized hill on each straight. There had been a recent truck race on this track, in wet conditions, and it was pretty badly chewed up. There were deep ruts, large accumulations of sandy soil and very large puddles which were growing as we stood there. Greg took his old Subaru sedan for a test lap and decided that the track was not usable, since the bottom of his car was dragging all the way. The 2WD cars would have a really hard time completing a lap. He called the track’s owner and asked for his help to groom the track. The owner came a few minutes later with a tractor hauling an I-beam and dragged it around for three laps. This smoothed out the ruts and mounds of earth, but the soil was so wet that traction would still be very difficult, especially since it was still raining. After some discussion, we decided to use the adjacent field and parking area, which is bare earth with some rough grassy areas. The owner dragged his I-beam around once to describe a track of just under one kilometre, using about 200 m of the oval track for the finish. Then we laid out cones to define the turns plus the start and finish boxes and we were ready to go. For the most part, the new track was much drier than the oval, although there were several places where the sandy soil was quite soft and muddy. The finishing section in the oval included a huge puddle at the bottom of the banking, with at least 6” of water, followed by very soupy mud all the way to the finish box. About halfway through the new route, we placed the cones in a manner which defined a series of three esses, to keep speeds down and to increase the difficulty. By this time it was about 10 o’clock and all of the competitors had trickled in and registered. There were 16 in total, with several sharing cars. In the AWD category there were a couple of old Subies with at least four drivers, plus a very nice Toyota Celica Turbo coupe. In RWD there was only Chuck with his 1982 Lancia Monte Carlo, since the guys with the old Datsun 510 couldn’t come. That left about 11 competitors in FWD, including myself, a VW Scirocco, a Saturn wagon and a VW Golf rally car, all shared by multiple drivers. Theoretically you can run a street car in rallycross, but hardly anyone does, because of the potential for damage and the guarantee of a major coating of sticky mud on everything. We began with a pace lap to learn the layout of the course and then the fun began. All the cars were assigned numbers (two for shared cars) and released one at a time for a single lap of the circuit. It was till raining lightly and pretty cool, so the driving was challenging, the “paddock” became a muddy mess and it was cold and wet just standing around waiting or marshalling. We use three marshals on the course to watch for any cones that might be hit (which score a four second penalty) and to be nearby with a fire extinguisher in case anyone has a problem. All the drivers must wear helmets, but windows could (and should in these conditions), be all the way up. I was car number 4, so the track hadn’t been chewed up very much when I took my first run. My time was a little over 1 minute 20 seconds, which is an average speed of about 45 km/h. That doesn’t sound very fast, but with tight turns and the muddy conditions, it feels a lot faster. Within a few tenths, that was my fastest time, since the track got worse before it began to dry out a bit in the afternoon. Fastest time for the day in FWD was about 1:18, from Vince in the VW Golf. During the worst conditions – just before and after lunch – everyone’s times went up, with my slowest being around 1:29. This was caused by getting into deep, soft sand in one of the turns, where there was very little traction in spite of my off-road tires. The AWD drivers were turning times around 1:11 to 1:15, while Chuck in the Monte was just a little slower than I was. There were a couple of times when cars got stuck in the soupy mud in the finishing section, but no one needed a tow. In these situations, their run time would be three minutes or more! Going through the esses, more than one car hit a cone, as they were trying to carry too much speed and tried to go through a gate sideways. This happened to me once, but I somehow missed the cones and finished with a time of 1:29. At the lunch break, I was fastest of the 2WD cars, by a margin of about 5 seconds (cumulative) over Vince in the Golf. The method of scoring is simply to add together all of the run times, so he would have two or three afternoon runs in which he could try to make up this deficit. As it happened, he was able to catch and pass me, due to a miscue on my part, some great driving on his part, and the fact that his car weighs about 1000 lb less than mine, with more power. The Mazda weighs about 3300 lb while the Golf is a little over 2000 lb, so it’s tough to keep up. Vince competes in stage rallies with this car (with Chuck as his co-driver), which has been stripped of all but the essentials (including Lexan windows), and equipped with a roll cage. So I feel pretty good about my ability to stay close to him. My last run of the day was about 1:20 – similar to my first run – still about 2 seconds slower than Vince. In spite of the worsening conditions, I had improved my technique by using the hand brake on three tight turns and going very wide on a particularly sloppy corner to find traction off line. At least the rain had stopped and the sun peeked out after about one o’clock, so the conditions became a little more comfortable. We stopped running about 2:30, picked up the cones, licked our wounds and were awarded trophy plaques. The AWD drivers took the top three places for the day, while Chuck won RWD (since he was alone) and Vince and I finished first and second (fifth overall) in FWD. Although a couple of cars had lost small parts during the day, everyone was able to drive home – or trailer home, in three cases. All of were carrying about 100 lb of mud, which took me about an hour to spray and brush off when I got home. There was so much mud under the car that at first I couldn’t find the tow hooks to strap it to the trailer! After I change back to street tires, I will take the car to the local self-wash to use their pressure washer under the hood and finish removing the mud from the underbody. My pressure washer has decided to stop working and I’m not sure my driveway drain can handle any more mud! Apart from the dirt, the Mazda is fine and looking forward to three more rallies before New Year’s. This was the ninth and final running of the PastaFazoom rally, organized by Cal Crouch to begin in Cortland, NY (about 33 mi south of Syracuse). Next year we will probably organize our own version (tentatively named “The Calzoom”) in the same area. This is the eastern edge of the Finger Lakes region, within the Adirondack Mountains and the roads are in very good shape for the most part, but very twisty and hilly (of course). The Ottawa contingent consisted of Jeff and Donna (’82 Spider), Marc and Julie (’80 Spider) and Chuck and Marsha (Lancia Delta Integrale AWD Turbo). We drove down Saturday morning and arrived in Cortland at the Ramada Inn around 3:30. We had been tops-down all the way, but it got pretty cool during the last hour and the sprinkles started at the same time we arrived. Beer and wine were broken out and our American friends began to arrive after 4 o’clock. There was Dave Church, who lives nearby, plus Bart Woodbridge from Pittsburgh (a 6-hr drive) and Dave Nene and Barb Halmi, from Erie, PA. These are all FLU folks whom we know from FreakOuts past. Another couple joined us for dinner, but not the rally – Ed and Carolyn from PA, whose home we visited on the way to FFO (Alfa Duetto Spider). After a few drinks and lots of laughs we went to dinner at a very busy, large restaurant called Hollywood. The service was a little slow and our waitress looked really stressed out. I commented to Julie that I could see her chest heaving as she attempted to use deep breathing to get her nerves under control. But there was a funny incident halfway through the meal when she asked if everything was OK with our meals. Ed said his little steak was OK but was he ever going to get the soup that was supposed to come with it? We all laughed gustily and so did the waitress, when we pointed out to Ed that he’d already eaten the soup!! It was raining steadily when we went back to the hotel, but we had a few more drinks, hoped for better weather in the morning and called it a night shortly after 9 o’clock. Sunday dawned with wet roads but no rain, so we started to be a little optimistic about our scheduled drive. We all had breakfast at Friendly’s, then Ed and Carolyn headed home. At 9 we gathered in a shopping centre parking lot, where the organizer was waiting for us. I believe his name is Cal Crouch and he’s quite a character. But an enthusiastic owner of an Alfa and a Ferrari 308. We chatted for a while as everyone straggled in, then received our route books and took off. I should have had a co-driver, since it was laid out like a normal navigational rally, with distance to turns, but without specified speeds. And it was laid out in miles, while my odometer is in kilometres. So I had to try to follow the other guys, read the instructions in case I fell back, annotate them to mark each completed instruction and convert them mentally to kilometres. I was pretty busy – especially keeping up to the others. These guys are nuts! The roads were wet, with occasional showers for the morning portion. The posted speed limit was 55 mph (90 km/h), with numerous warning signs for 25-40 mph curves, and lots of steep downhill sections. These guys were routinely doing 120-140 km/h, with bursts up past 150! There were lots of farms with who knows how many trucks, dogs, children, horses, etc. that might appear in the road over the next crest. But Cal was confident that on a Sunday morning it just wouldn’t happen. I’m not comfortable with those kinds of risk, especially when I can satisfy my need for speed at the track. So I fell back a few times, as much as a kilometre or so, but would catch them at the next stop sign or village. At one point I missed a turn because they had gotten especially far ahead, but they sent out a scout and I realized my mistake, so it was all good. The odd thing was that Bart and Dave were behind me in Bart’s ’72 Spider (original owner – nice burgundy car), but they weren’t reading the route book and didn’t know we’d missed a turn. We stopped for lunch at a place called The Boathouse, on a medium sized lake (don’t know the name). The owner (named “Dad”) had opened it up especially for us, so we had a mixed lunch of burgers, dogs, salad and speedies. What are speedies, you may ask? Think of shish kebab-sized chunks of chicken, grilled without the skewers. After lunch it was raining steadily, so the speeds had to come down and we all stayed pretty closely grouped. It was still pretty spirited driving, but at more reasonable – if still illegal – speeds. The total distance was about 180 miles. We finished up at a gas station near Dave Church’s house, where we all filled up. Marc and Julie left for Ottawa since she had to work Monday, while the rest of us went to Dave’s. We killed about 3 hours drinking, snacking and chatting before having a nice barbecued chicken dinner. He has an unusual house he built on the edge of a conservation area, surrounded by bush, fields and a pond. The house is perched on top of a two-car garage, so it is very compact and really only suitable for a single guy, which he is. So it was cozy and fun, but we’d all had lots of fresh air and excitement, so we tired early and left for the hotel before 9 PM. Monday morning we left Cortland in overcast skies to meet Dave for breakfast in Tully. Bart and the other Dave and Barb had been his house guests, but they left at 5:30 AM for PA. So we had a good brekkie at a nice family restaurant and left there a little after 9. Everyone else was going to the big shopping mall in Syracuse, so I just headed home on my own, getting here in 3-1/2 hours. It was a lot of fun and adventure, and a bit hairy at times. If I do it again, I will take a co-driver! I now have more respect for the handling capabilities of the Spider, even on 15 year old tires. It ran flawlessly and used virtually no oil. Maybe it’s been waiting for a work-out like that all along. Pictures are available here – but there are no action shots! Welcome to my blog. My name is Peter and I live in Manotick, Ontario which is part of the City of Ottawa. Many people know me as “KILRWAIL”. That is the vanity plate I have on my 1977 Porsche 911S, which I use primarily as a track car, although it is licensed for the street. I also have a 1978 Fiat 124 Sport Spider, which I bought new in August 1978 while living in Montreal. The third resident of Fearless Garage is a 1993 Mazda MX-3 which I use for navigational rallying. My shop was named Fearless Garage by my brother Rick, after I rebuilt a broken camshaft timing dowel on the Mazda. I am willing and able to tackle almost any job on all the cars, including brakes, suspension, electrical and engine work. The exception is the Porsche engine, which I leave to a specialist – there are too many complexities in there to fool around with! Outside the garage is a 2002 Dodge Ram 4×4 pick-up truck, which is used to haul the cars to various events on an open Miska trailer. This blog will contain descriptions of my experiences in many different events, varying from track days to rallies to outings in the Fiat with the Italian Car Club of Ottawa and/or the Fiat Lancia Unlimited club. Many such activities are recorded in a book I published in 2008 called “Owning an Icon…and DRIVING it!”, which is a general sort of memoir (so named by a book store owner), but aimed at Porsche owners who have yet to take their cars to the track. The book is available by sending me an e-mail to dpimotorsports@yahoo.ca. I hope you enjoy reading about my hobby and I welcome all comments! You are currently browsing the Fearless Garage blog archives for October, 2009.